Who is the union? YOU are! By definition, a labor union is the collective voice of its members, speaking as one for the benefit of all. This is especially true at UFCW 1167, where united action has won an impressive series of victories for our members and working people everywhere. Through our solidarity, we have accomplished wages that set the standards for all of the industries we serve, from supermarkets to medical offices, from factories to pharmacies and many places in between. That’s not all. Our members enjoy superior health benefits, pension plans, guaranteed working hours, safeguards for fair treatment, holiday premium pay, vacations, discounts and other features that non-union workers can only dream about. All of these things are possible because our members identify with their union and participate actively in ensuring its success. It is important to protect our successes and build upon them, not just for ourselves as individuals, but for the benefit of future generations. Attend union meetings. All members are invited to Local 1167’s Quarterly Membership Meetings, where they can learn about their union and the issues we are currently addressing, such as collective bargaining, organizing campaigns, market share protection strategies, and enforcing the union contract at our workplaces. Participate in union actions. At the Membership Meetings, you’ll learn about specific union actions you can take, including informational picketing at non-union employers, distributing handbills, attending rallies and more. Follow us on social media and use the UFCW 1167 app. 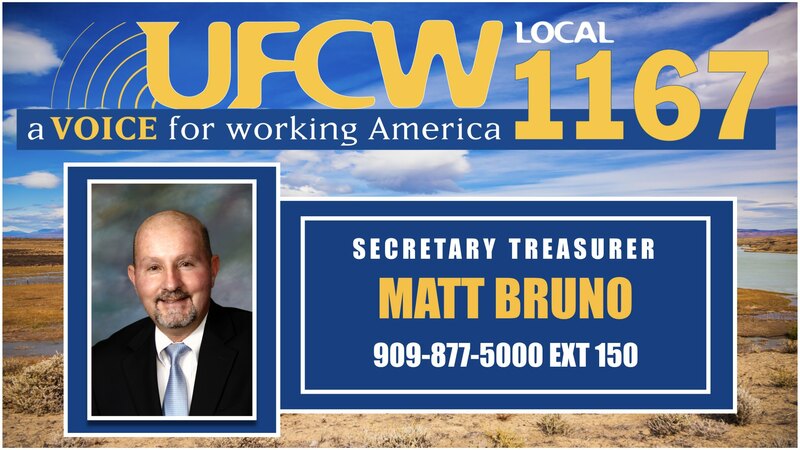 Keep informed about union developments via Twitter (@UFCW1167) and Facebook. And by downloading our new app for iPhone and Android, you’ll be able to receive news alerts and have fast access to your union contract, workplace rights and notices about negotiations and upcoming membership meetings. Get involved in politics. Every union member has a responsibility to participate in the political process to ensure the success of worker-friendly candidates and causes, as well as the defeat of anti-worker candidates and causes. You can help by joining our Active Ballot Club, which finances our union’s political efforts, and you can participate directly in voter education projects. You can contact legislators and other officeholders to promote pro-worker initiatives. And, of course, be sure to register to vote and then cast your ballots for pro-worker candidates and causes! These are just a few of the many ways you can get involved in your union. Ask your Union Representative for information about opportunities to participate. After all, the union is YOU!